Jamie Lester, award-winning sculptor known for projects including the Brooklyn Wall of Remembrance at MCU Park and the Jerry West statue outside the WVU Coliseum, recognizes the value of tapping into today’s powerful 3D imaging solutions in the creative process. And so Jamie is breaking the mold – literally and figuratively – buying 3D imaging scanners Artec Eva and Space Spider to use as part of his creative process. With over 20 years of experience, Jamie muses, “3D scanner is a flexible tool that helps me view the world in a whole new way. 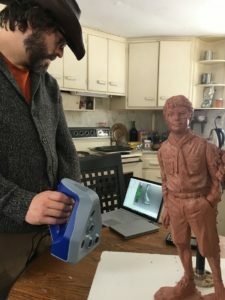 It unleashes new creativity into the work that I’ve been doing the same way for a very long time.” Once he realized the enormous potential of 3D scanning, it just made perfect sense to purchase the Artec 3D scanners to use during his creative process. No one will doubt that sculpting is physical in every way. The end result is a three-dimensional structure situated in a space invariably shared by viewers. Just the very imposing presence of a statue itself evokes a unique aesthetic effect that two-dimensional representational art can only mimic through tricks of perspective and vanishing points. As for sculptors, working and shaping clay over prolonged periods demand a tremendous amount of exertion. For sculptors like Jamie, 3D solutions can help ease things a bit. And as Jamie’s example confirms, the transition from clay to bronze, design to installation is markedly faster with 3D scanning tools. Jamie’s process starts off with gathering images and sketching designs of the statue. He then moves to 3D form by modeling a “maquette,” a small clay statue. This preparatory step enables him to tease out potential design problems in an already 3D context and find solutions to them early at the start. This maquette is also especially useful for clients, who can see what the final design will look like and give the green light. 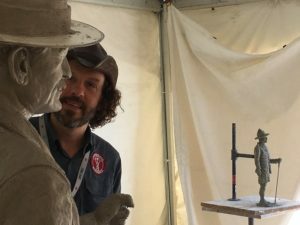 If the client is satisfied with the design proposal, Jamie begins the labor-intensive part of the creative process – hand-sculpting the clay to the actual size of the statue. To illustrate the extent of this transformation, one of Jamie’s works was a bronze statue of the NBA legend Jerry West, which started out as a fifteen-inch tall maquette that Jamie had submitted to the reviewing committee. Twenty weeks and 1000 pounds of clay later, the tiny figure grew into a monumental clay statue that now stands in its bronze form at six feet six inches (minus its three-foot base). Click here to read more about Jamie’s unique creative process and the benefits his Artec 3D scanners provide to the final masterpiece. Want to know more about Artec 3D products and how they can help your production needs? Click here and an expert from The SolidExperts will be happy to answer any questions you have.